You’ve just been offered a new job and have decided to accept the offer. How should you formally accept the position? It’s always a good idea to accept a job offer by sending or giving your new employer your acceptance in writing. A job acceptance letter allows you to demonstrate your professionalism and make sure there is no confusion about the precise terms of the offer, such as compensation, vacation time, or benefits. It’s also an opportunity to express your gratitude for being offered the position, as well as your enthusiasm for taking on the new role. The letter can be sent by email or mail. If you’re sending a hard copy through the mail, format the letter as you would any business letter. Include your contact information and phone number, even though it’s on file with the employer. When sending an email letter, put your name in the subject line (Your Name – Job Offer Acceptance). This helps ensure that your message will be opened and read. No matter which way you send the letter, make sure to address the letter to the person who offered you the position. Keep it brief. While you want to include all the most important information, this doesn’t mean your letter should be long and drawn out. The employer is busy, so a concise letter that includes all the necessary information is best. Express your gratitude. Demonstrate how thankful you are for the new job opportunity. You might want to briefly explain why you’re particularly excited to work for the company. For example, you may want to share your desire to contribute to their sales team, or your passion for their mission. Again, keep this polite but brief. You don’t want to create any last-minute reasons for the employer to take back the job offer, such as a sloppy or unprofessional letter. Watch out for spelling and grammar. Go over the letter a couple of times to make sure you catch all the typographical errors and grammar mistakes. While you’re at it, it’s a good idea to double check the spelling of the name of the person who offered you the job. 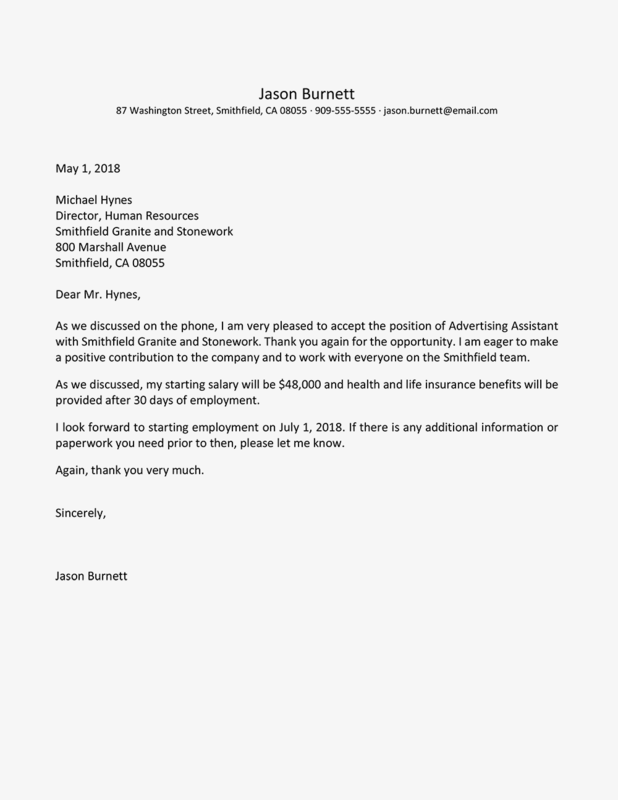 This is a job acceptance letter sample. Download the letter template (compatible with Google Docs or Word Online) or read the example below. It was wonderful to speak with you on the phone yesterday about the Marketing Director role at ABC Company. I’m thrilled to formally accept this job offer. I’m looking forward to working with you, and the rest of the senior management team at ABC, on charting a new direction for marketing strategy. As we discussed, my start date will be May 13, 20XX, with an annual salary of $65,000, and three weeks of paid leave annual. This salary does not include company provided health insurance, which is effective on my start date. I’m looking forward to seeing you next Monday. Please let me know if there is any paperwork or additional information you need from me beforehand, or if there is any documentation I should bring along on my first day. I’m always available on email, but feel free to call if that’s more convenient (555-555-5555).